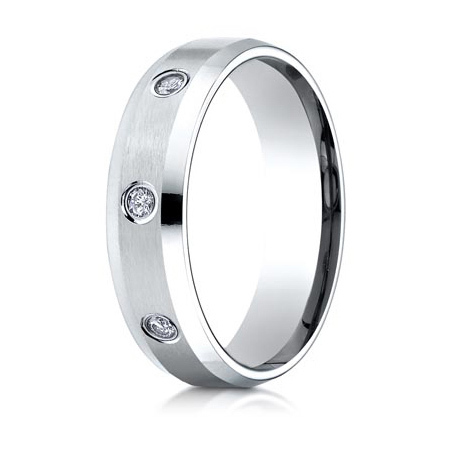 14kt white gold 6mm wedding band has eight round brilliant diamonds. Satin finish and polished beveled edges. Die struck and comfort fit. 8 x .04CT round brilliant diamonds. Diamond color G, clarity SI1. Diamonds are carefully matched and subject to stringent inspection. Precision-set. Made in USA. The precision setting process allows as much of the diamond's surface to be displayed while also providing superior security for the stones. Hand-set diamonds are often inconsistently secured and have an uneven surface.